16-17 July 2016, Sat-Sun. 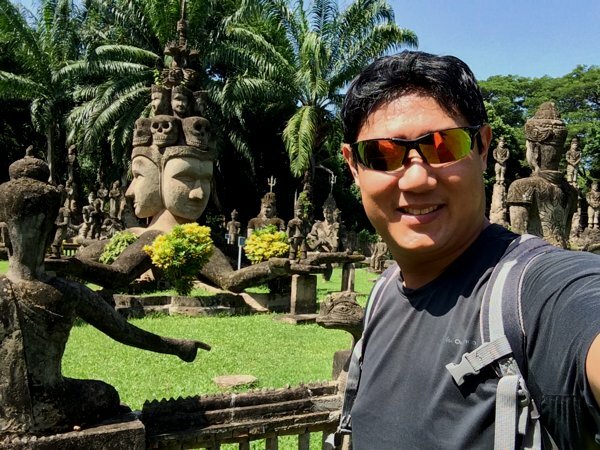 And so I decided to set off for Vientiane – the capital city of Laos. 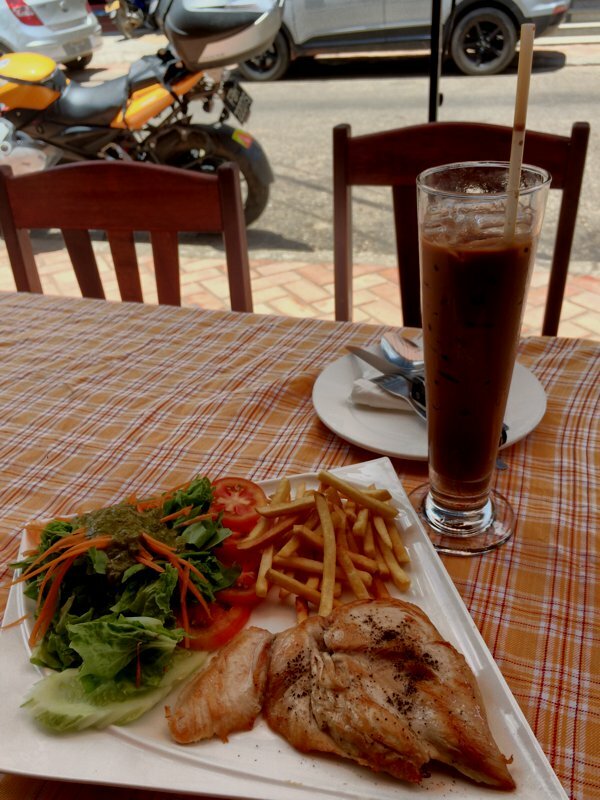 Breakfast in Vang Vieng in a nice little cafe with wifi somewhere near my hotel. Needed that wifi to update the blog as the hotel’s wifi was horribly slow. Meet Nicole from Ohio, USA. She’s here on a work-holiday programme. Works in the cafe in exchange for food and accommodation. No pay. Great way to “tour for free”. Almost. 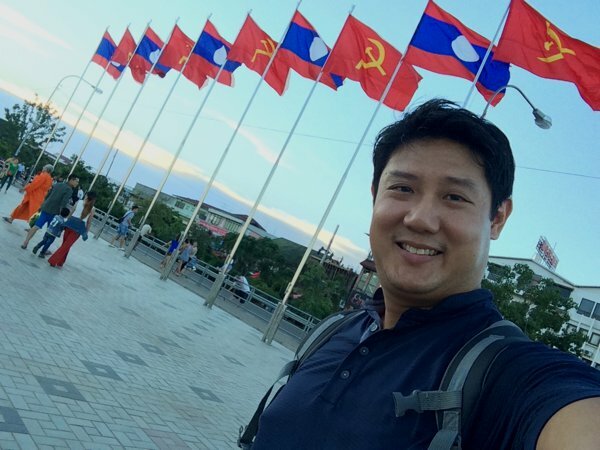 I was worried about the roads from Vang Vieng to Vientiane. If the roads remained what I was used to in the last couple of days, I think I’ll have to re-plan my Laos trip. I typically plan for my travels based on an average of 70kmh. But in the last few days, I was probably travelling on average at half that speed. Thankfully, the roads to the capital city started getting better and straighter as I approach. And for the first time in many days, I see speeds of 80-90kmh on my speedometer! Then my rear brakes started binding again. Not as bad as before, but noticeable nonetheless. Okay – just a couple more kilometres to go before reaching Vientiane. I’ll go check out the Bajaj dealership when I arrive. 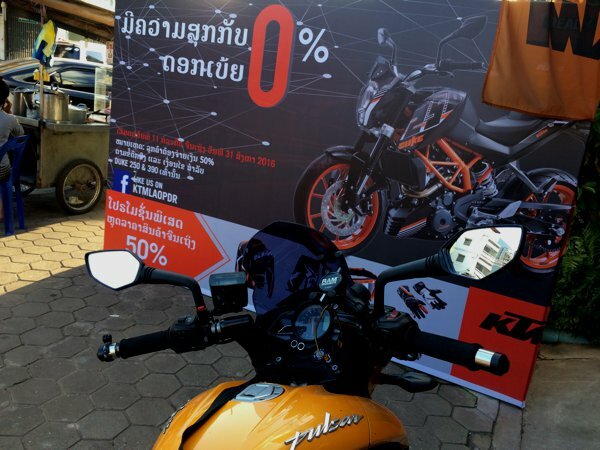 And then I reached Vientiane, only to find out that Bajaj has pulled out Laos and there are no more dealers. What a bummer! 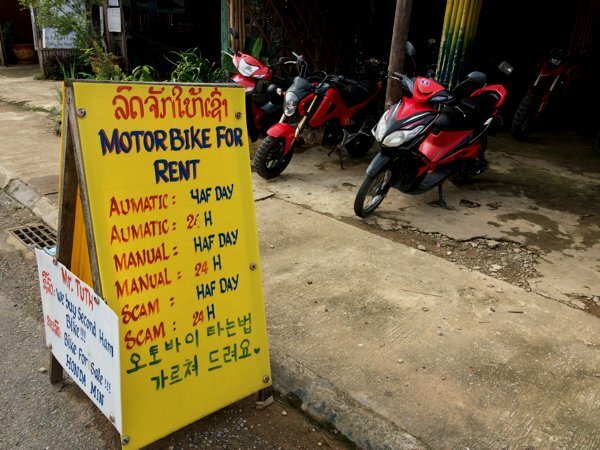 I did some quick research, and everyone recommends Fuark Motocross – the only reliable “big bike” service centre in Vientiane. Programmed the coordinates in my GPS and headed there with all my luggage in tow. Fuark Motocross motorcycle repair shop. Mr Fuark wasn’t around. So, for the 2nd time, I cleaned out my rear brake master cylinder. These guys seem to be a little more knowledgeable than than the mechanic I used in Luang Prabang. I hoped this resolves the brake binding issue. After I sorted out my accommodation in Vientiane, I headed to the KTM dealership to get my broken mirror (and possibly new rear brake master cylinder) sorted out. 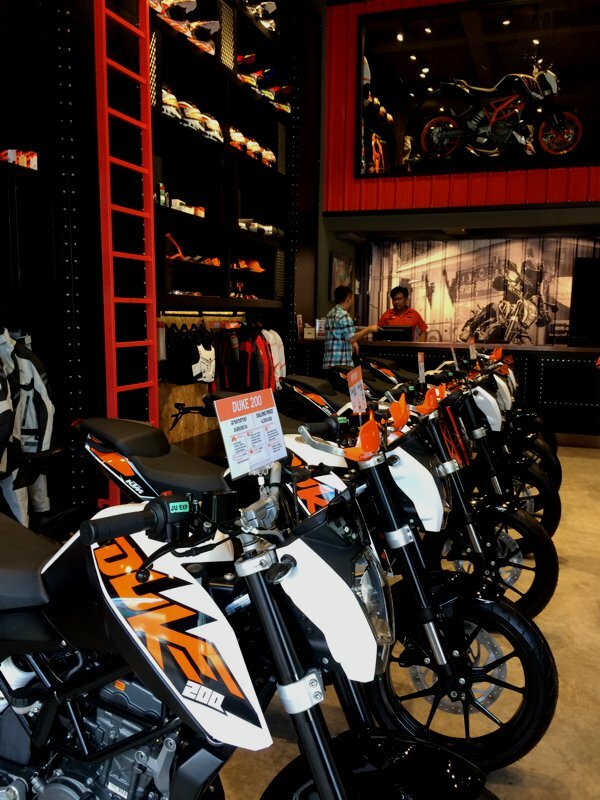 Brand new KTM machines all lined up. New KTM Duke 200 mirrors on my Bajaj Pulsar 200NS! I actually liked them better than the Bajaj’s OEM one. 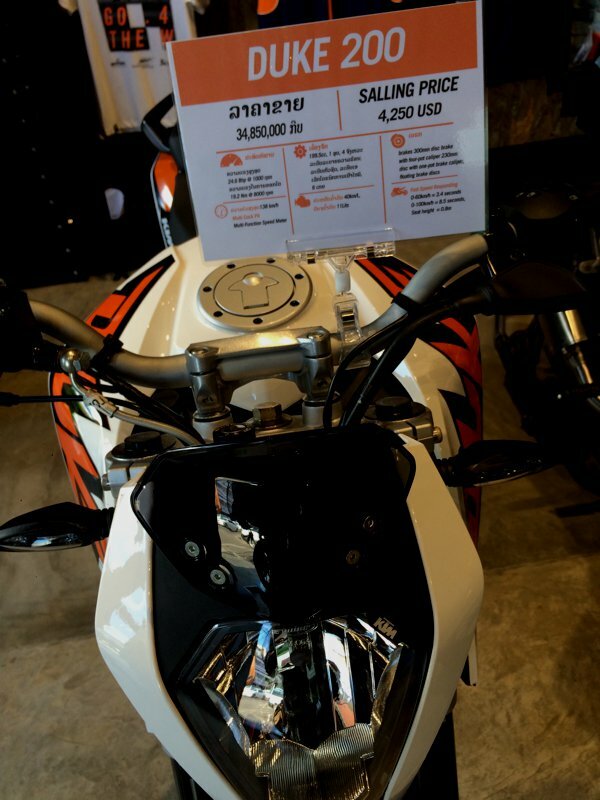 Duke 200 for USD4,250. It’s TRIPLE this price in Singapore. 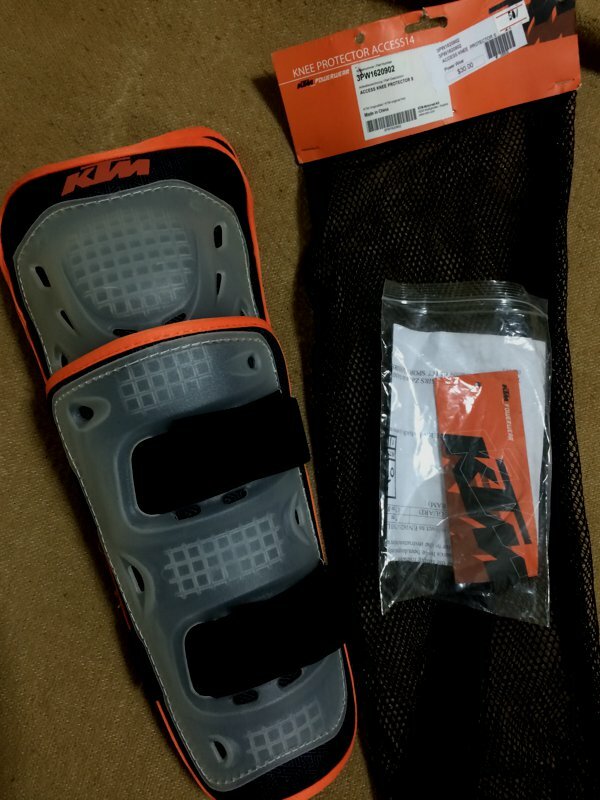 The KTM knee protectors were going for 50% off. USD15 a pair. I got a set. 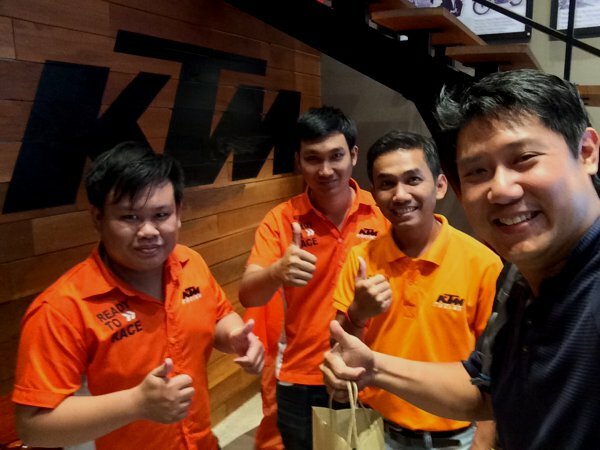 The friendly folks at KTM Vientiane. It’s strange. KTM wouldn’t sell me the rear brake master cylinder for the KTM Duke 200. Reason? They don’t sell it to non-KTM riders. Really? In fact, they had to make a special exception for the mirrors. Spent the evening walking along the Mekong river. There was a night bazaar and I spotted several groups of locals line dancing along the river. You can clearly see Thailand just across the Mekong. 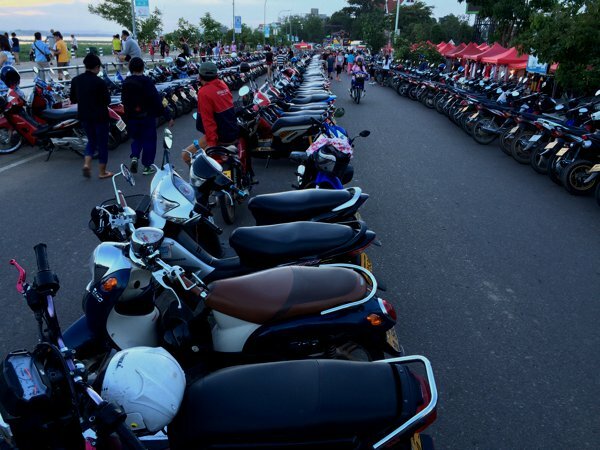 Motorcycle parking at the night bazaar along the Mekong river. 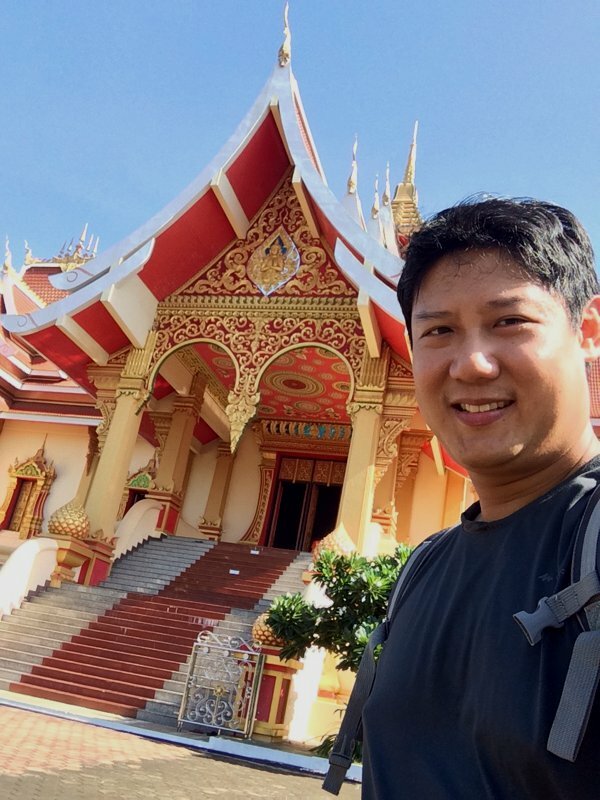 I continued to explore Vientiane the next morning. 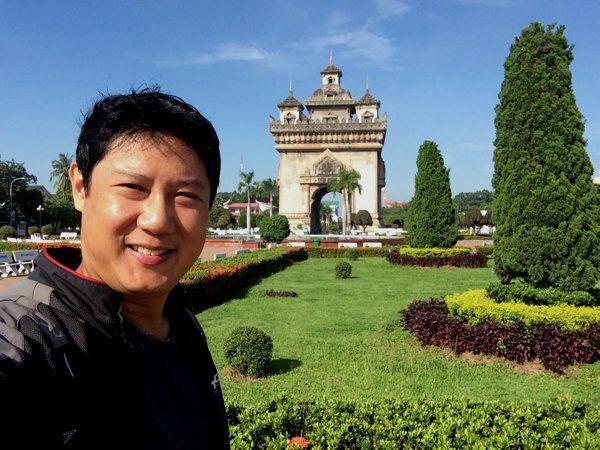 The Patuxay (Victory Gate of Vientiane) resembles France’s Arc de Triomphe. 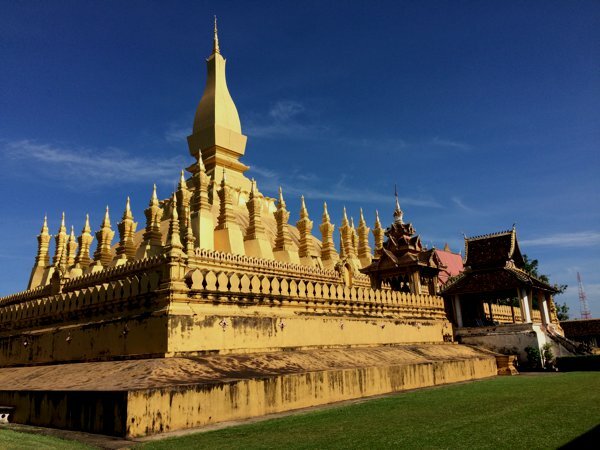 Pha That Luang (Great Sacred Stupa) is supposedly the most important national monument in Laos. 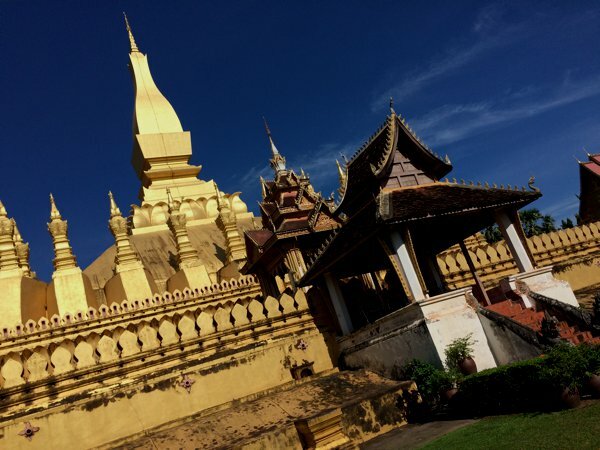 It is a symbol of Buddhism and Lao’s sovereignty. I see this on every 50,000kip bill. Another view of Pha That Luang. 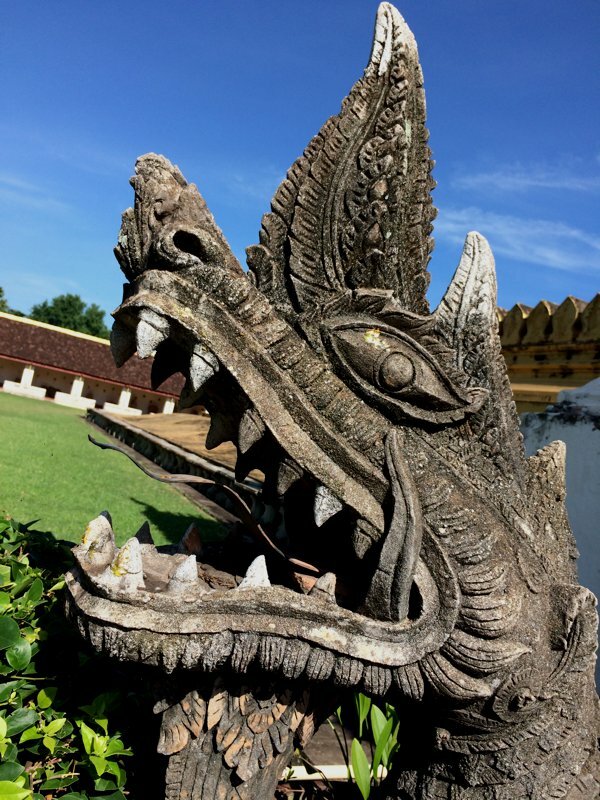 Detail of a stone structure inside Pha That Luang. A newly built temple beside Pha That Luang. Name of temple? I don’t know. It just says “temple” on my GPS. 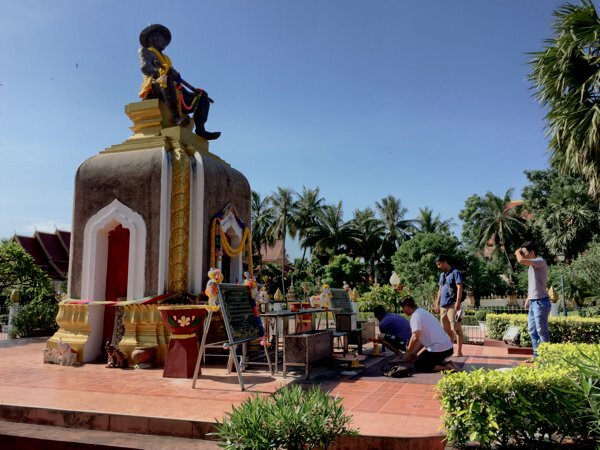 Locals paying respects to the statue of King Sai Setthathirath. Yeah – they let me ride up to just the outside of the temple grounds. 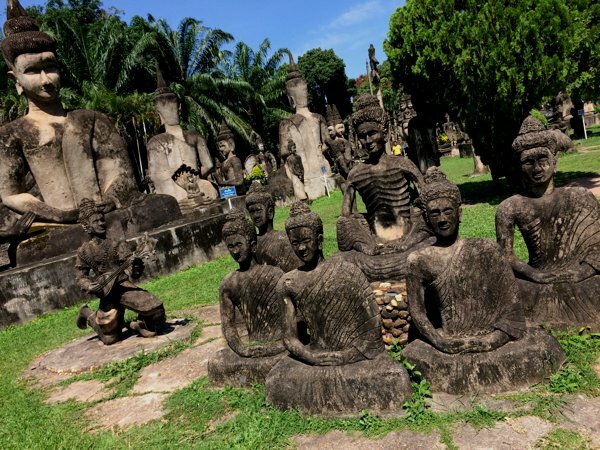 Then I went to the Buddha Park – a 30min ride from town. Halfway there, I met a police roadblock. 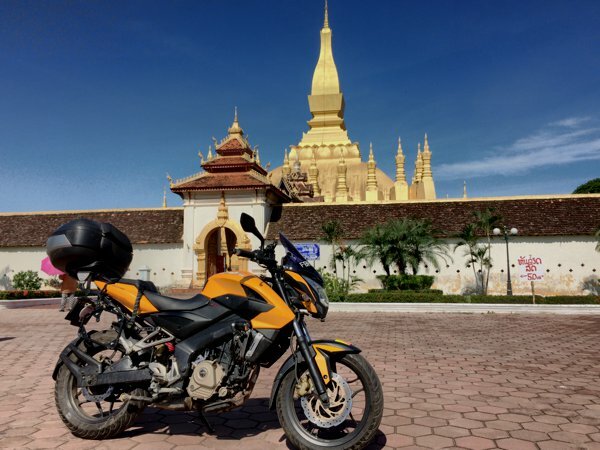 Perhaps the Laotians don’t get as many overland tourists, I’ve been getting stares everywhere I ride, and have been stopped at every police roadblock. But this was the first they asked and insisted on seeing my license. No problem. I had them with me. And the police waived me on. Halfway there, I lost all brakes on my rear. It seemed that my rear brake master cylinder finally gave in and leaked badly. Now I REALLY got to have it replaced. 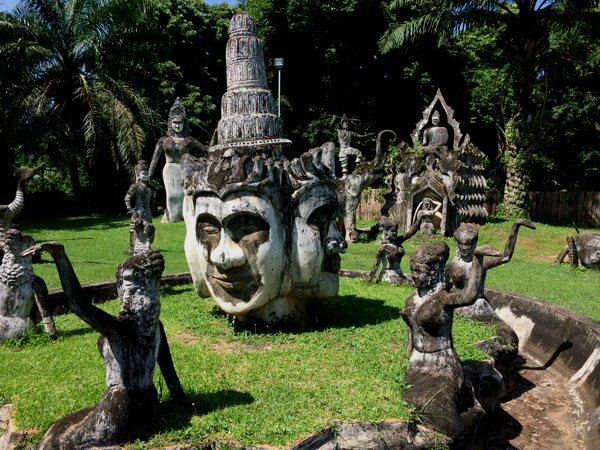 The Xiengkuane Buddha Park is a major tourist attraction. 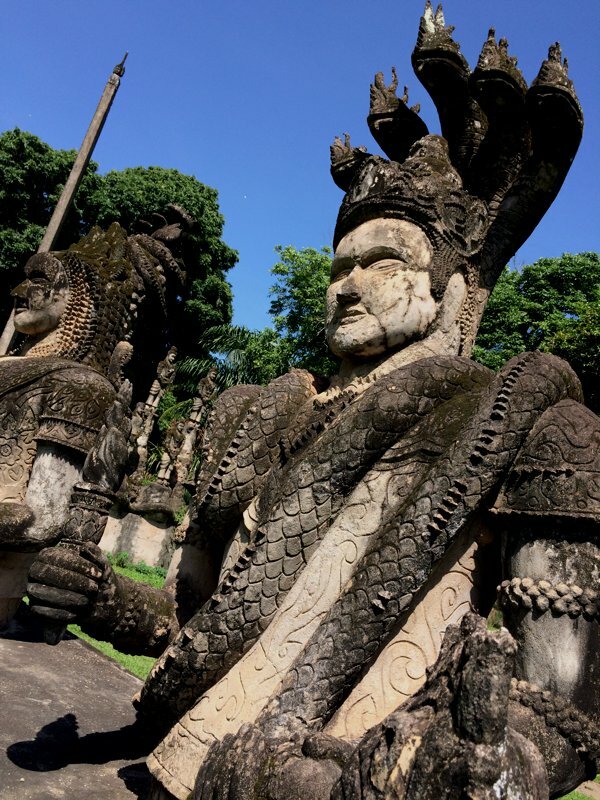 Stone statues like this are everywhere. Hey! You there! Who? Me? 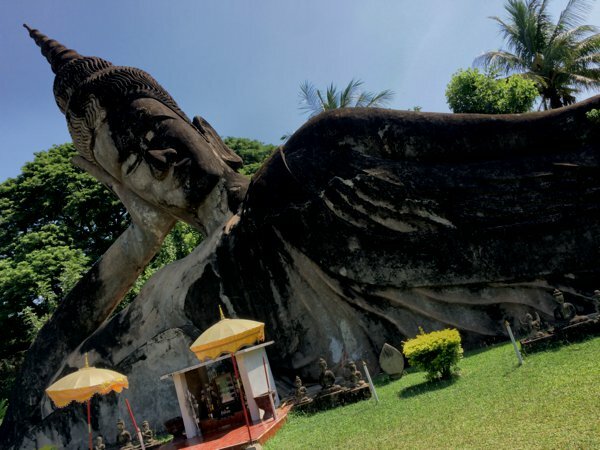 The main gigantic statue of Buddha lying on his side. Hey Medusa! What are you doing here? 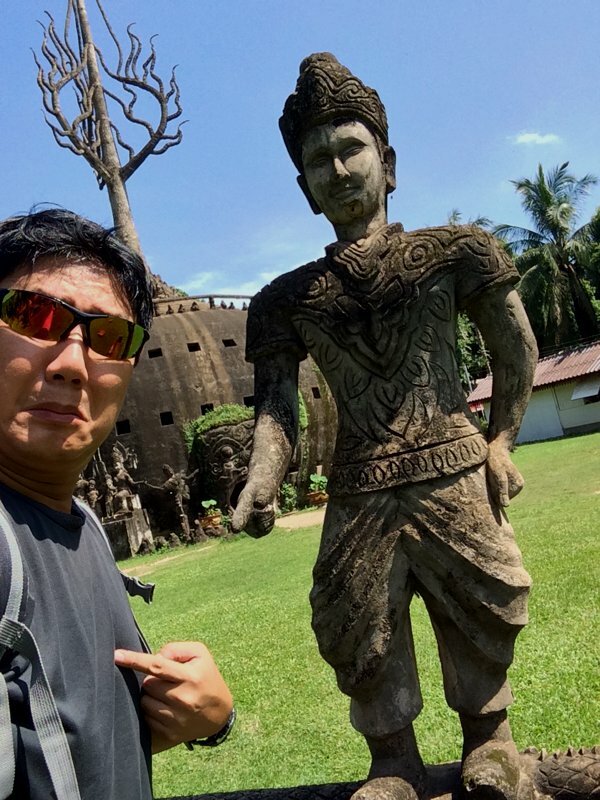 This guy can’t be too ancient… He’s wearing a modern suit! 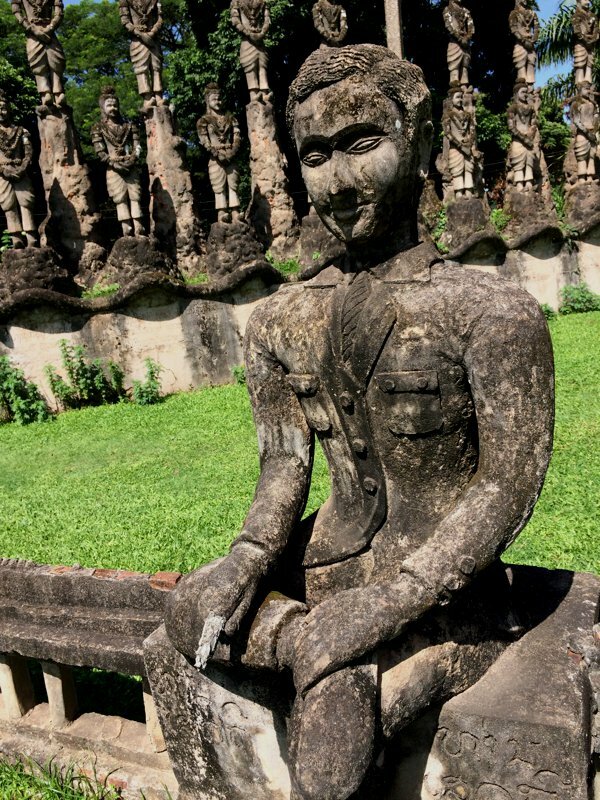 More stone statues in Buddha Park. This guy looked like he’s been to Pisa, Italy. He’s even learned to lean a little to one side. While savouring my lunch, I overheard 2 diners admiring the Pulsar and trying to guess where it was from. “Nope. It’s from Singapore!” I answered. So we chatted a little, and I lamented that my rear brake has totally failed and I need to get parts. And one of them directed me to a parts shop in Vientiane which *might* just have the parts I needed. 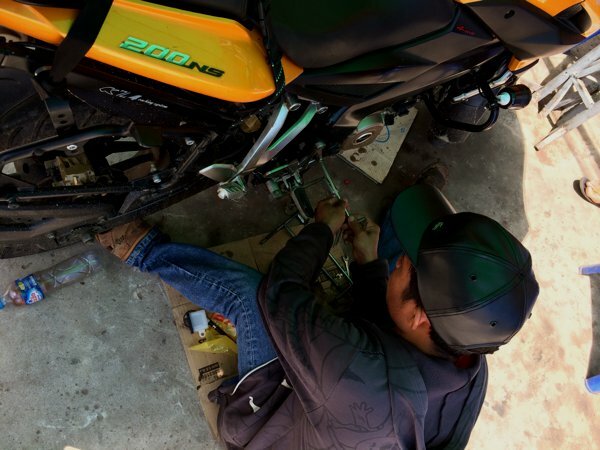 Although Bajaj has pulled out from Laos, some shops may still carry some parts. 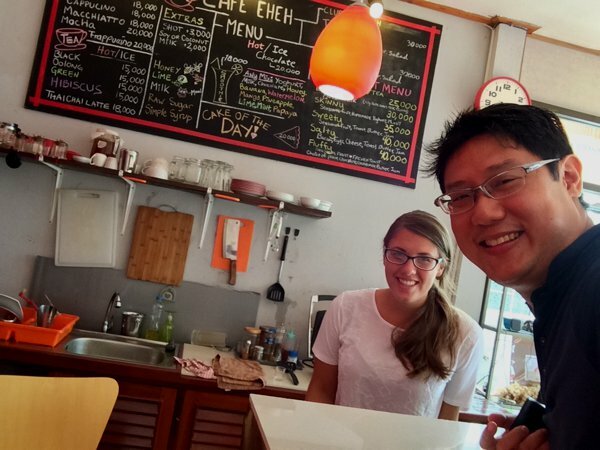 The two English-language teachers in Laos who pointed me to the bike shop that might have what I needed. So I headed to the motorcycle parts shop immediately after lunch to check out. Turns out they didn’t have Bajaj parts. But…. 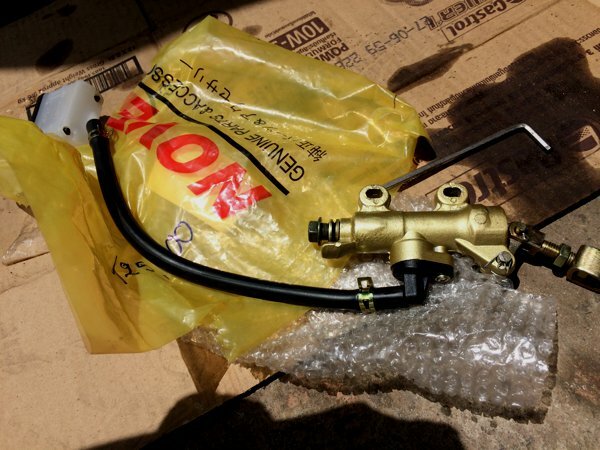 They took a quick look at my rear brake master cylinder, went back in to the shop, and came out with a brand new master cylinder of an unknown brand that looked somewhat similar. After some trial and error, the shop guy sawed off half the actuating stem, drilled 2 holes bigger, trimmed the length of the cylinder reservoir tube, and viola! I have a functioning brand new rear brake master cylinder! No Bajaj parts. 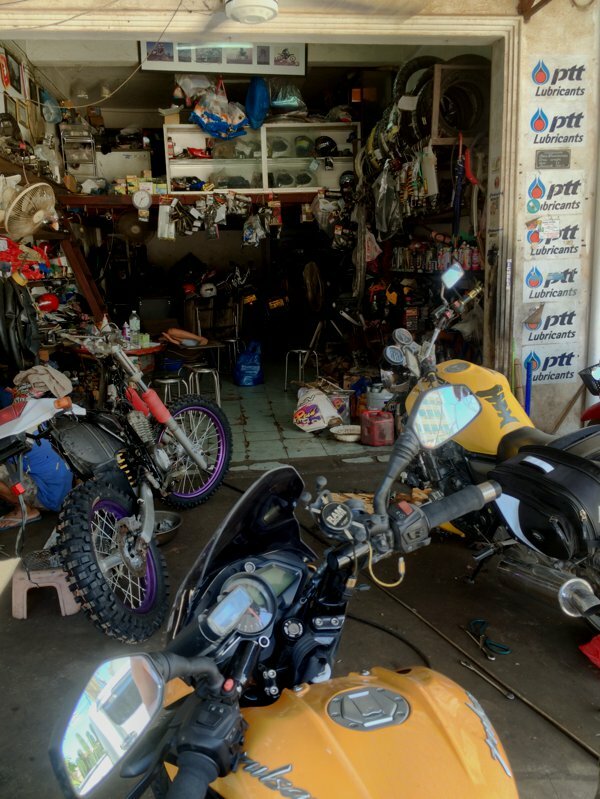 No KTM parts. No OEM parts. Only something which remotely resembles the original, a little modification and a “can-do” attitude. 150,000kips (SGD25) for the part and the installation. The shop guy working on my rear brake master cylinder. Finally! Now my bike’s in perfect working condition again! Oh please… No more bike troubles, please. 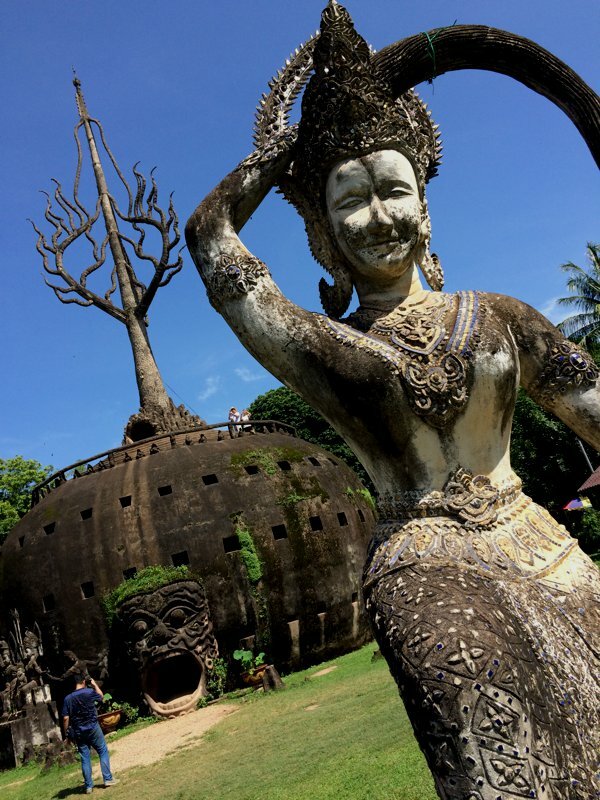 I’m leaving Vientiane tomorrow.